Various investment firms have been trying to get a Bitcoin ETF approved by the Securities and Exchange Commission. Last month the SEC denied a Bitcoin ETF proposal by the Winklevoss twins. The SEC’s primary reason for the denial: the possible manipulation of the price of Bitcoin. "The Commission believes that, in order to meet this standard, an exchange that lists and trades shares of commodity-trust exchange-traded products ("ETPs") must, in addition to other applicable requirements, satisfy two requirements that are dispositive in this matter. First, the exchange must have surveillance-sharing agreements with significant markets for trading the underlying commodity or derivatives on that commodity. And second, those markets must be regulated." The March rejection resulted in the price of Bitcoin tumbing, and the same happened after the July decision. Crypto currency investors want a Bitcoin ETF or ETP. This will open up the institutional markets to investment in crypto currency. Now another firm is trying to be the first to get approved for a Bitcoin ETF. VanEck, an investment firm in New York, has been working on getting a Bitcoin ETF approved for over 3 years. The SEC is set to make a decision on the VanEck fund on September 30th. An exchange traded fund would open up Bitcoin to institutional investment, and hopefully, a mass influx of money into Bitcoin. 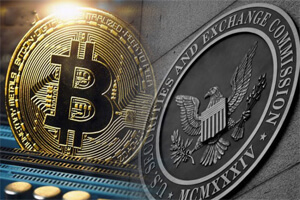 However, Gurbacs went on to warn, that once a Bitcoin ETF is finally approved, it will come with additional governmental regulation – something the Bitcoin community is strongly opposed to. But without regulation, Bitcoin can never go mainstream. The SEC has 9 more Bitcoin ETF proposals in front of them, each with a pending decision. They are set to make final decisions on these proposals over the next two months. ProShares has a proposal with a decision due by August 23rd. GraniteShares has a pending proposal with a decision due by September 15th. Direxion has a proposal with a decision due by September 21st. Numerous other investment firms trying to get their ETF approved. Although the SEC could reach decisions on these proposals earlier, history has shown the SEC likes to release their decision right before the deadline.